I’ve been guilty over the years of neglecting one of the most important rooms in my home when it comes to decorating — my bedroom. Far too often it has gotten the short end of the stick, way down on the totem pole compared to the “public” areas of the house: the living room, kitchen and so on. Now for me this doesn’t make much sense because most everyone who knows me well knows that one of my most favorite things to do is SLEEP…so I spend a good amount of time in my bedroom. Why not make it one of my favorite rooms in the house? Fun, colorful and affordable lamps are readily available at most big box and home improvement stores — consider a matching set for symmetry. Don’t be shy with these, table lamps are a perfect item to add a pop of color. Already have a set of lamps you like? You can simply replace the shades for a quick update. Ready to make a bigger statement with light? Today’s trend is bringing the lighting once reserved for the dining area or entry into the bedroom. 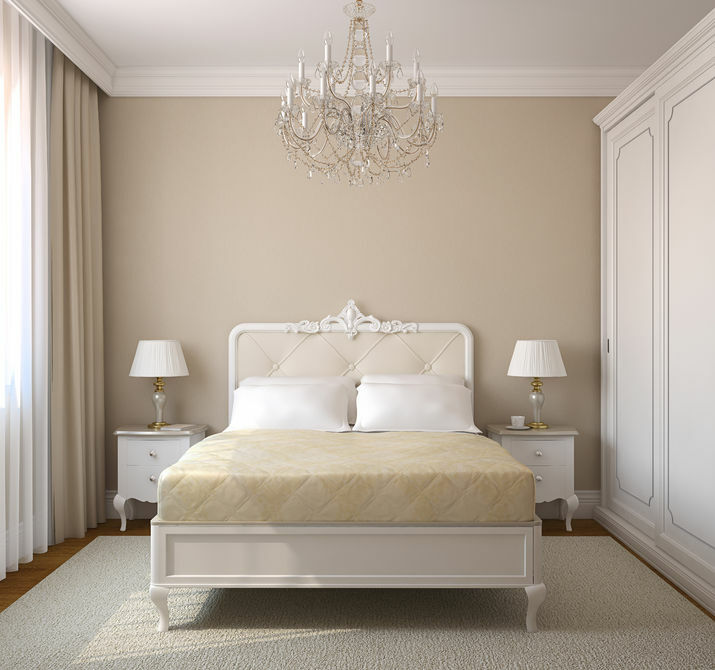 A chandelier above the bed will make a dramatic and bold statement. Remember, lighting is a terrific way to have fun with your decor. Replace the hardware on your nightstand, dresser or closet doors. From retro to traditional to modern, new hardware can change the look of a piece of furniture and update the entire room. Inexpensive, quick and packs a powerful punch — what could be better! Treat yourself to new bed linens and enjoy. There are so many wonderfully soft options today. Be on the lookout for higher thread counts and natural options for your sheets like bamboo. Splurge a little on the higher-end sheet set but keep the palette neutral. You can bring in color with throw pillows or a bright throw at the base of the bed. I just recently added a rug under my bed and it’s one of my all-time favorite updates. We purchased an 8 x 10 shag for under our queen bed. We pulled the rug out about 3 feet from the foot of the bed and centered it side to side. We’re just fine with the nightstands not having the rug underneath them and having extra at the end of the bed creates the perfect, cozy walkway. My recent bedroom project included going with a warm white on the walls, just a hint of a shade off the white woodwork and then painting the ceiling a tranquil, sky blue. The look is subtle and calming and a little unexpected. Moreover, you can also easily update that dresser you’ve had since you can’t remember by painting that, as well. So clearly, spoil yourself with a quick and inexpensive bedroom re-do — you’ll be glad you did!